I would rather play “Guess what edible item is in the brownie” than “Guess what INedible item is in the brownie”! I love looking at blog stats. So many people pouring out questions to the universe. Google is the new Magic 8 ball, after all, and it’s at least as helpful and accurate. Stef – I assumed that the phrase “guess what edible item is in the brownie” inferred that everything around it was INedible. You’ve had some wacky blog stats, as well. I love seeing what you come up with. Is the owner(s) of Cheeky Monkey the same as Solo Vino? They have a great wine shop. Lisa – No, the owners of the two shops are not the same. Solo Vino just happens to have the gossip because they are next door, and because the stores will compliment each other so well. Solo Vino is definitely a great store. You ever come to NYC? What is your favorite restaurant here? I would go try it out on your recommendation. Possum – I lived in NYC, but as a poor graduate student, and I’m too far out of the loop to say much about the restaurants. I can’t even remember the one I adored tucked away in the corner of the West Village. I did love going to Balthazar, and I just recently wrote a post on Bar 89. Thanks for commenting. This is one of the funniest food blog posts I have read in a long, long time. Thanks for the laugh! 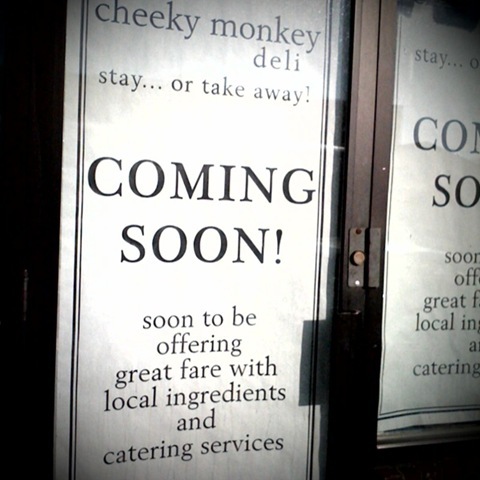 Oh, and I cannot wait for Cheeky Monkey…although they sure seem to be taking their sweet time over there. Ella – Just a vague use of modifying pronouns on my part! The people at Solo Vino have answered my questions about “the proprietor” of the deli. They told me his name, but who knows where I wrote it down. The stores and owners are separate, linked up only by a common window in the dividing wall and complimentary food and drink. I had the opportunity to try out Cheeky Monkey last night on an invited only guests and the food is great. The owners are partners in another business (service related) and because they own the building, decided to try their hand at opening a restaurant. They do have restaurant experienced employees working for them and so there shouldn’t be issues for customers to worry about. The food is made fresh on site including all the sauces (you have to try the potato chips and the macaroons). I had the meatloaf sandwich and my husband had the pot roast sandwich and we both loved them. I highly recommend going there. I know I will go back. They open officially for lunch and evenings on Wednesday, February 11, 2009. Thanks for the update, Cindy. It sounds like I’ll have to make a trip to the deli this weekend. What I had meant to say was, I think Cheeky Monkey is delicious. To echo Cindy’s comment, the staff seemed to be very experienced (one server even works at Bon Vie across the street during the mornings). I’m excited to have it in the neighborhood! Chicken Coop – Just checked my feed, and I didn’t have a problem. Please check again!